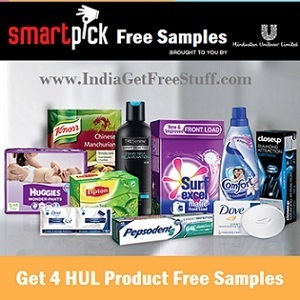 After Reward Me Free Samples of Products by P&G now Hindustan Unilever Limited (HUL) is offering SmartPick Free Samples of their products through website Smartpick.co.in. You can order upto 4 samples for free. 1. Select 4 HUL Products here that you want try by getting free product samples. 2. Add any 4 Product Samples to cart. Then Click on Checkout for Free. 3. Register by filling Name, Email, Mobile No, Address etc. 4. Verify OTP number received on mobile to confirm the registration. 6. Note the Airway Bill No. Check email for more details. Products will be delivered in 3 weeks. Smartpick.co.in gives you the power of choice that can help you discover new products that you have not tried. In addition to trying new products you can tell us about your experiences. It is an online platform created by Hindustan Unilever Limited (HUL), a market leader in Indian consumer products with presence in over 20 consumer categories such as soaps, tea, detergents and shampoos amongst others with over 700 million Indian consumers using its products. Users can choose from a range of products and order 4 SmartPick free samples. Hello..I need this items.. I need,,Dove soap,,Closeup paste,,Treaseme Shampoo and conditioner,,Surf Excel matic.. I have not received any sample but received mail and message that samples are delivered successfully. Also contacted customer care but they said samples are not available, we will send it afterwords. But I asked them, then why I have received mail and message for successful delivery? Will be very happy if get those samples.